Peel it, seal it, wheel it and deal it! What better way to house your mail content than with a secure cardboard mailer? 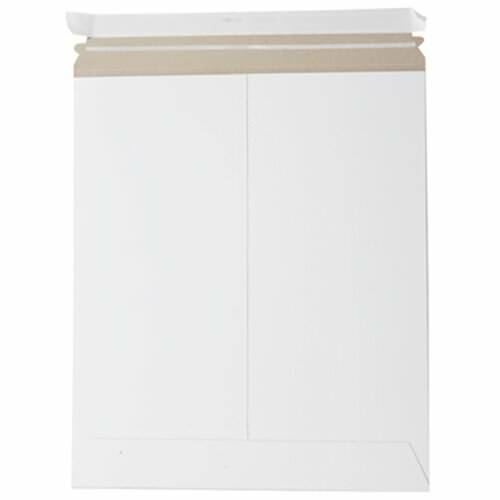 Use these colossal White 12 3/4 x 14 Envelopes to send out photographs, calendars, brochures, important work documents and any other materials in need of extra safe keeping. A durable cardboard finish combined with a secure peel and seal closure is an effective way to ensure that your mail will be kept intact and safe from any wear and tear. Combine those two features with a bright white exterior, and you got yourself a classic look! Whether you want to decorate the white 12.75 x 14 envelope with markers for that special gift or want to keep it professional and simple and keep it plain, these white mailers are sure to make a statement. These White Cardboard Mailers measure in at 12 3/4 x 15 inches, feature a rectangular peel and seal closure style, and are 100% recycled.